We will be adding new things as we continue to create our web site. UpWord Mugs with designs to help you feel good! We create hand-thrown custom logo mugs for your business or special event. For information regarding the creation of your own custom mugs, contact Kim Vasil, kim@vasilscene.com. Mugs are aproximately 16 ounces, made of wheel-thrown stoneware. 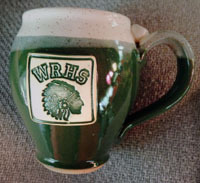 They sport West Rome's green and white colors. Mugs are $18.00 each plus $15 Shipping/Handling per mug. Local pick-up in Rome, Georgia is also available to avoid shipping charges. Class years may be added for orders of 10 or more. 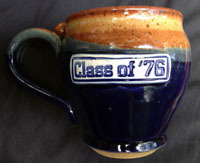 Mugs with class years are $20.00 each. Email us for more information, kim@vasilscene.com. 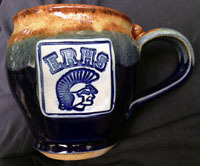 Mugs are available with East Rome High School logo on one side only or with Class of '76 on one side and ERHS on the other. Shipping is $15.00 per mug. If you are local to the Rome, Georgia area, opt for local pick-up to save the shipping charge. Other years are available for orders of 10 or more. For any questions please contact us at kim@vasilscene.com.